'Next, I applied to work in the accounts department, a sealed room where women operated clattering machines like enormous typewriters. After I had catastrophically and erroneously applied all the wrong information to several trolley loads of documents and lumbered the staff with weeks of corrective work, I was shown the door by a tight-lipped manageress. I knew what was coming. Over the relentless, furious din of machinery, I lip-read the familiar words: "Lacks the necessary aptitude."' 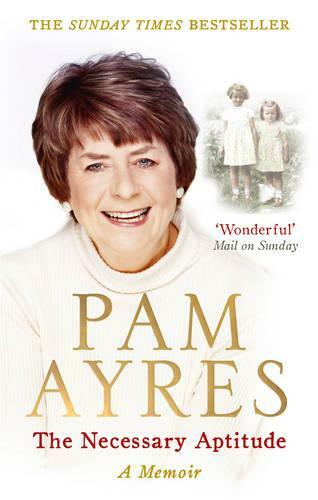 Pam Ayres' early childhood in Stanford in the Vale was idyllic in many ways, and typical of that experienced by a great swathe of children born in rural areas in the immediate post-war years. Though her parents' generation was harrowed by war, better times were coming. Everything the family needed was within walking distance in the village, and life with four older brothers and a sister in their crowded council house was exceedingly lively. In her late teens, Pam grew dissatisfied with her life as a Civil Service clerk with only the local 'hop' for scintillating excitement. Having seen three of her brothers called up for National Service and sent off to exciting destinations, Pam felt desperate for travel and adventure. She joined the WRAF and soon found herself in the Far East. There she began to write in earnest, and develop the unique talent that would make her one of Britain's favourite comics... Written with Pam's much-loved combination of humour and poignancy, The Necessary Aptitude is a beautifully written memoir of her early years. this book brought back so many memories of my childhood in the villiage where i was born,especially the privy and being able to roam the countryside without any worries,really loved this book.